Red Wine, Green Tea and Dark Chocolate: What's Cooking? Who says we have to suffer...to live a healthy happy vibrant life? Red wine and dark chocolate... might seem decadent...but these guilty pleasures also might help us live longer...and healthier lives. Red wine and dark chocolate definitely improve an evening..but they also contain resveratrol..which lowers blood sugar. Red wine is a great source of catechins..which boost protective HDL cholesterol. Green tea? Protects your brain..helps you live longer..and soothes your spirit. Red Wine, Green Tea and Dark Chocolate, the blog, is about living the good life...a life we create with our thoughts and our choices...and having fun the whole while! I say lets make the thoughts good ones..and let the choices be healthy...exciting...and delicious! Bon Appetit! Yesterday I ran into the market to pick up a few things and spotted a gorgeous filet of salmon...so I thought I'd blacken it for supper...and it was well...delicious! Here are the seasonings..I keep a little jar of this ready so that when I'm in the mood for a bit of zip..it is ready to go. Place a cast iron skillet onto your grill and let it get really hot. Cooking this dish indoors will fill your kitchen with smoke..I speak from experience and do not recommend it. If you don't have a skillet you can use on your grill, just grill the salmon directly on the grill...which is what I did this time. Mix the seasonings, and pour some in a flat bowl. Brush both sides of your salmon steaks or filets liberally with coconut oil, normally I cook with olive oil but I'm blackening here so I want an oil that can handle a higher heat..coconut oil is great for this. 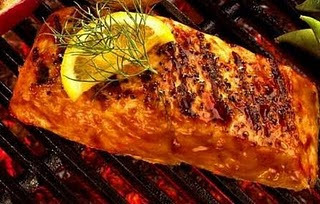 Now press one side of the salmon down onto the spices, and then place the seasoned side down in the skillet or on the grill. Sear/grill until blackened. Flip the salmon over and cook till it is done to your preferred degree of doneness. A green salad...some sauteed spinach, a loaf of crusty bread..and you're good to go! I hope you'll tune in! But if you can't listen live hear the podcast by clicking here. All day long tea drinking, medical journalist, radio host and health educator living the good life...I'm passionate about cooking and sharing recipes. On my radio program "Food for Thought" I love to share tips for living a healthy life. If I'm not at my desk...I'll likely be found in the kitchen. If it is growing season I'll be in my garden..or if I'm working I'm probably jetting around teaching or attending conferences. On the very best days I'm on a horse somewhere...or on a boat...or in the mountains along a river loving nature. My message is simple: embrace prevention, eat well... mostly fruits and vegetables with a few ounces daily of high quality proteins (Think Mediterranean Diet) Embrace daily exercise and evidence based supplements like fish oils and vitamin D. And be kind... to yourself and others. Subscribe to "Notes From the Universe"
A Lifespan Calculator. Try it! Supermoon! Get Ready To Do Some Howling! Followers...Please do me the honor! "Life should not be a journey to the grave with the intention of arriving safely in a pretty and well preserved body, but rather to skid in broadside, thoroughly used up, totally worn out, and loudly proclaiming - WOW---What A Ride!"